Every now and then, after Trader Joe’s comes out with a particularly weird or goofy food product, I get to feeling a little bit superior to Trader Joe’s – sort of like they’re my wacky next-door neighbor. Worth it: Yes. A delicious hummus substitute. And without exception, every time I start to feel this way, Trader Joe’s turns around and absolutely embarrases me with a product that is elegant, nuanced, and grounded in a rich culinary tradition that I’ve never even heard of. 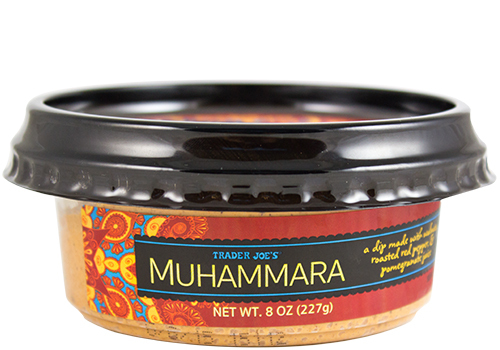 Yes, today we’re reviewing Trader Joe’s Muhammara – a delicious, hummus-like spread with a cool, dark red color and a smooth, gently earthy, mildly piquant taste. Unlike hummus, that can taste a bit grainy or mealy due to the garbanzo beans it’s made from, muhammara is a blend of walnuts, roast red peppers, pomegranate juice, olive oil and bread crumbs. While that sounds like it would result in a weirdly lumpy or heterogenous texture, it couldn’t be more smooth and velvety – perfect for veggie dip, cracker spread, or pita filling. The taste itself has quite a bit of the mildness of a red pepper roasted to softness, and only a subtle touch of the nuttiness of walnuts, and even less of the tart pomegranate flavor you might expect. In fact, muhammara is generally made with pomegranate molasses, much more similar to the pomegranate syrup we made up than mouth puckering pomegranate juice. As such, the muhammara also has an understated touch of sweetness to it that makes go down particularly smoothly. Despite never hearing of it before, I enjoyed the hell out of my muhammara. It was good with pretty much whatever I tried it with, and made an excellent “before dinner” snack with just a handful of Triscuits I had at hand. I’ve always been a little bit ambivalent on hummus – which generally ears out it’s welcome with me after a few bites. Muhammara has all the qualities I like about hummus, the soft spreadable texture and cooling, snackable taste, with an added edibility and improved texture. As you may have guessed from the walnuts and olive oil, muhammara shares hummus’ high fat content – but thta’s simply the nature of the beast. Buy a tub, enjoying it moderation, and you won’t regret it. Would I Recommend It: If you like hummus, give this a try. Would I Buy It Again: I do think so. Final Synopsis: Just like hummus, but a little tastier.